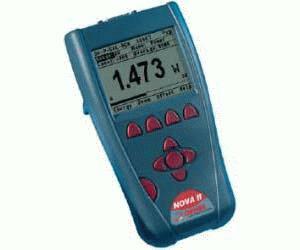 The Nova II is the most versatile and sophisticated handheld laser power/energy meter on the market. Just plug in one of the many Ophir smart heads and you have a whole measurement laboratory at your fingertips. Besides measuring power or energy from pJ and pW to hundreds of Joules and thousands of Watts, the Nova II has many on-board features such as laser tuning, data logging, graphing, normalize, power or energy density units, attenuation scaling, max and min limits. For those who prefer an analog display, the Nova II can also display the power or energy with a high resolution simulated analog needle display. The Nova II can be operated either by battery or from an AC source with the charger plugged in at all times. Its backlight allows illumination of the display in low light conditions.